Examinations are seen as a ‘make or break’ situation or a ‘do or die’ battle by many students. For some others, it is a cause for stress and anxiety. It can start in many ways -- inability to catch with revision or feeling pressure from school or family. Often there is a heightened pressure to do well and not to let down your family and teachers! Some amount of anxiety is actually beneficial -- it can increase motivation in students. But too much stress and anxiety will be harmful as it will interfere with one’s confidence and will affect concentration. For many students, it is difficult to share their troubles and anxiety with their parents and teachers due to various reasons including fear of being considered weak and vulnerable. Hence a discussion on this subject is very essential. Education is critical for development and is vital for building human capabilities and opening up opportunities. In the past few decades, our country has made impressive attempts in the field of education. The students are doing their best – they are studious and mostly disciplined and they obtain degrees. But there is another end of this scenario where, many graduates do not have even rudimentary problem-solving skills, making themselves unemployable. This is not quality education. Every student aspires for academic success for not only intellectual pursuits but also to earn a livelihood, to get respect and also social mobility. Now a stage has come, where the success of a student is decided by his/ her examination score rather than the knowledge or skill they acquire. In such a background and with the need to excel in today’s competitive professional world, students are under extreme pressure. Academic stress has become a pervasive problem across countries and cultures. 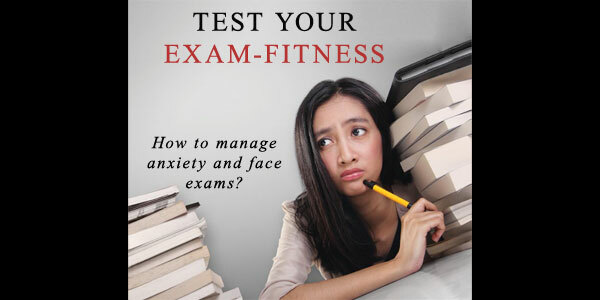 The stress during examination can be the product of student’s aspiration and parental expectations. Our examination system is also to be blamed. Aspects such as application of knowledge, problem-solving capacity and innovation are hardly tested. Instead, the student’s memory and rote learning are given importance. Student’s ability is being assessed by a single examination than by continuous appraisals. Facing examinations is a reality. And facing this reality is a process that should start from the very first day of one’s course. Examination itself is an important motivation to study. When a student feels, either that he has a very high ability or very low ability with respect to the material covered on a test, the ability (prior knowledge) attribution reduces the motivation to study. When you perceive that knowledge determines the outcome of a test rather than effort, you study less. A few other things that can motivate you include learning the material; fulfilling potential; boosting feelings of self-efficacy, through accomplishment and achievement; meeting or exceeding the expectations of others and determining for oneself, if you can achieve by trying hard to do so. Keep up with readings: Reading portions before class help to make the lecturer’s points more obvious, give an opportunity to clarify or elaborate on points made in readings. Be regular with your assignments and read rapidly in order to cover as much as possible, sometimes even skimming the material, which complements careful reading. Prioritize readings depending on the subjects you need to improve upon and also based on the importance of the topics. Attend classes: Class attendance permits discussions with classmates and provides opportunities to interact with teachers about the things to be emphasized as part of preparations for the examination. They can help you with important clues that can facilitate understanding. Manage test preparation time: Manage time carefully by designating particular times through the week for the preparation for a particular exam. Students can distribute study time by dividing preparation into a series of sub-goals such as completion of particular chunks of content. Begin your preparations sufficiently early rather than waiting for the time shortly before an examination as cramming results in learning that’s easily forgotten. Use strategies to process material: You may use a number of methods to process already learned material which include (i)Re-reading assignments and notes; (ii)Rewriting lecture notes; (iii) Highlighting and memorizing key concepts, definitions, and formulae; (iv) Making up rhymes, acronyms, songs, stories, and images to connect important ideas and remembering the connections; (v) Developing outlines, tables, figures, and graphs of important information (vi) Seeking help, from textbooks and library sources to computer data bases and mass media to peers, classmates, and instructors and (vii) Creating an overarching conceptual structure integrating ideas in text and lectures. Reduce distractions when studying: These include restricting yourself in your room, switching your phone off, resolving the crises then and there, etc. Prepare in study groups: When the group members are well prepared, group study is very helpful by providing clarifications and expansion on your understandings. It avoids the risks either understudying or over-studying, by providing feedback about test readiness and facilitates memory. A good mood can permit great concentration which can in turn facilitate studying well. A bad mood almost always has a negative effect on study. Examination experiences: Get feedback that includes information about methods to improve comprehension and future test preparation. Tests early in the term provide information about future exams and how they should be approached, informing students about test format, content covered, and the grading test responses. Social environment: The encouragement from teachers, family and friends motivate studying. Distraction and doubt about the competence expressed by people around interfere with the performance. Physical study environment: Get adequate space to spread out materials being studied. Also make sure that the sound, temperature, and lighting are also comfortable in the environment. Avoid being in too much comfortable areas like a bed to study. Healthy lifestyle habits: Do not starve, avoid junk foods, have plenty of water and take your food on time. Researchers have found that those who are physically active do better at school. Activities such as walking, jogging and swimming are some of the methods that can be practised. Brain consolidates or reinforces what was learned or observed, during night. What counts is getting enough sleep each and every night. Maintaining adequate sleep routine helps you to remain alert and responsive. The amount tends to decrease with age; still an average adult needs 7-8 hours of sleep every night. As per statistics, during the period of examinations, the prescriptions for anti-depressant drugs (or the so-called happy drugs) witness an increase. This is true especially among teenagers in the age group of 16 to 19 years, engaged in full-time education. The figure crosses 20% in schools in the West. The fear of failure and that of letting down parents are two of the most common factors leading to suicide and depression in this age group. It should be noted that certain students handle all situations easily, while others find it difficult to manage even the trivial ones. The duty of parents and teachers remain the same all the time -- to encourage and support our children and students, irrespective of their perceived brilliance, unconditionally! “The history of the world is the history of a few men who had faith in themselves. That faith calls out the divinity within. You can do anything. You fail only when you do not strive sufficiently to manifest infinite power.” (Swami Vivekananda). Senior Resident, Pushpagiri Institute of Medical Sciences,Tiruvalla.